In his seven-year tenure as head coach, Norm Bazin has ushered in an era of record prosperity for the UMass Lowell men’s hockey team. Rarely appearing anything but cold and calculated from the Tsongas Arena to the far-reaching corners of Hockey East, it is oft-noted that Bazin is not quick to show emotion. He is a man rarely photographed wearing a smile on the bench and has never been known to lose his composure when faced with tough in-game scenarios. It’s no wonder that, with his unique mannerisms and outstanding track record, the student body has developed not only a fondness for and interest in Coach Bazin, but an entire mythos surrounding him. On social media and in everyday conversation students refer to him as a strong, calculated leader: The Coach That Never Smiles. For Coach Bazin, it just is not that simple. “If I appear [calm and calculated] most times, it might be kind of like a duck. What’s going on underneath the water might just be a good bit more active than what’s going on above,” said Bazin. There are layers with Coach Norm Bazin, and what you see on the outside does not always reflect the cogs churning within. This may just be the strongest tool in his arsenal. Composure is key. Bazin’s composure allows him to refocus his energy and emotions to make logical in-game decisions in the fastest game on earth. “I just believe you have to act a certain way in order for your players to be calm… Nothing good ever happens from being irrational. When people are clear headed, they’re breathing, they can think. They can think and react quickly,” said Bazin. And the results Coach Bazin sees reflect this assertion. Taking the helm in the aftermath of an abysmal (5-24-4) 2010-11 season, the worst performance by the River Hawks since their 1984 Division 1 transition, Bazin’s leadership resulted in not only an immediate by-the-numbers turn-around for the team, but a cultural paradigm shift. In their first year under Coach Bazin, the River Hawks finished tied for 2nd place in Hockey East and appeared in the NCAA Regional Finals. In the years to come Bazin’s River Hawks would see unparalleled success: five consecutive Hockey East Championship bouts, three of them resulting in victory, two Hockey East regular-season titles, the list goes on. Bazin would go on to receive three Bob Kullen Hockey East Coach of the Year Awards and a Spencer Penrose Division 1 Coach of the Year award. Yet, for all this, Bazin remains humble as ever. “I’m just not certain I deem myself successful… yet,” said Bazin. Having quickly accumulated so many career decorations, it is hard to believe Bazin himself is so hesitant to deem himself a “success.” But this forward-looking attitude and contention with complacence may just be what makes Bazin appealing to professional franchises. 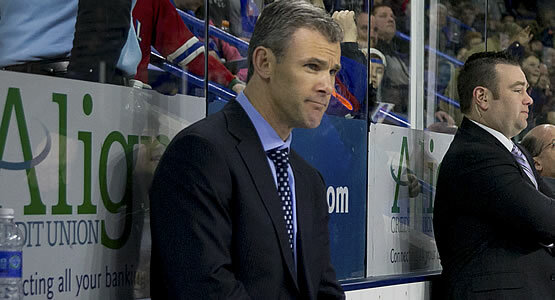 So appealing, in fact, that following the 2016-17 Hockey East Championship run the Vancouver Canucks offered Bazin a role as head coach of their AHL affiliate, the Utica Comets. Still, despite the immense career mobility being offered Bazin, he has been reluctant to pursue such offers. Perhaps this is a result of Bazin’s strong ties to UMass Lowell. As a member of the Class of 1994, Norm Bazin was given the opportunity to play the sport he loved at a Division 1 level. In his final year with the team, Bazin was second on the team in goals with 20, closing out the season 35 points in 39 games played. In fact, it seems that heading the UMass Lowell men’s hockey team provides Bazin with a sense of purpose. “I really enjoy coming to UMass Lowell to make the small difference. We’re all spokes in the wheel… and I think leaving my small legacy on a great school is what gets me out of bed: Having that impact,” said Bazin. UMass Lowell seems to have provided Coach Bazin with just what he was looking for: A platform from which he can impact others and make a difference. In his time with the team, not only has Bazin cemented his legacy and seen records broken and wins pour in, but he has had the opportunity to make an impact. In his seven years, he has coached six players that would move on to the National Hockey League and has had a profound impact on a vast number of student athletes.